Salman Khurshid is a designated Senior Advocate at the Supreme Court of India and a prominent politician. He is the son of Khurshed Alam Khan a former Union Minister of External affairs, Government of India, and maternal grandson of Zakir Hussain, the third President of India. Salman Khurshid was the Cabinet Minister for Law and Justice, and Minority Affairs in the Government of India. He was also made the Union Minister of External Affairs in the Government of India in the year 2012. He had his education from St. Xavier's High School, Patna, Delhi Public School, Mathura Road. St. Stephen's College, Delhi and St Edmund Hall, Oxford, Oxford, UK (B.A. (English and Jurisprudence), M.A., B.C.L.) He also taught Law at Trinity College, Oxford. In this Interview, he speaks on variety of topics including NJAC, Land Ordinance, Entry of Foreign firms to India, Legal Education, National Law Schools, Gopal subramaniam issue etc. Live Law: Sir, as you are no doubt well aware, the enactment of the National Judicial Appointments Commission Act is the subject matter of challenge in the Supreme Court, and the proceedings have evoked a great deal of interest amongst the public and in the media. What is your considered opinion on the constitution of the National Judicial Appointments Commission? Do you share the view of many people, including those in the legal circles that the collegium is a failure and must make way for a National Judicial Appointments Commission? Salman Khurshid: I find it difficult to accept “dooms day” theses being propounded. I am not sure if the Supreme Court has taken these arguments very seriously. Salman Khurshid : Sadly the arguments before the Supreme Court are only about how the different systems have worked or not worked. There has been very little presentation of the fundamental concepts including the ‘Basic Structure’. We shall wait and see how the debate fares once the Constitution Bench pronounces its judgment. Live Law: Some of the provisions in the National Judicial Appointments Commission Act have caused a flutter in the judicial circles and even been adversely commented upon by the Bench hearing the challenge to the National Judicial Appointments Commission Act. In particular, the provision relating to the composition of the commission which included 2 eminent persons and the ‘veto’ powers exercisable by 2 members of the Commission are being interpreted by some as shifting the balance of power in the appointment process from the judiciary to the executive which goes against the dictum laid down in the Second and Third Judges Cases which accorded primacy to the judiciary in the appointment process. Does this Act strike at the independence of the judiciary which has been judicially recognized as a basic structure of the constitution which cannot be touched by Parliament? Sir, how do you, look upon these provisions of the Act? Salman Khurshid : Something that is theoretically ideal has to be examined in terms of social reality. Live Law: Sir, the seniority principle has practically displaced merit in the matter of appointment and elevation of judges over the past 3 decades or so in our country. This has been a subject matter of debate in judicial and academic circles. As a former Union Law and Justice Minister, and senior advocate how do you evaluate the impact of the scrupulous adherence by the judiciary and executive to the ‘seniority principle’ in the matter of judicial appointments? Has the blind adherence to seniority often at the cost of merit, or at any rate, above merit, deprived otherwise qualified and brilliant High Court judges such as Justice G P Singh (who authored the classic treatise, “Interpretation of Statutes”, Justice A P Shah etc of a SC judgeship? Is it time to revisit the seniority principle and establish the primacy of merit over seniority? Salman Khurshid : The trouble is that the cure should not be worse than the disease. One needs to think more deeply before taking a final call. Live Law: Sir, in your latest Article on Justice V.R Krishna Iyer, you have opined that with the seniority principle in place Justice Krishna Iyer would never have come to the Supreme Court, and remarked that it would have been an enormous loss to Indian jurisprudence? You were the Union Law Minister during the UPA years. Couldn’t you and your government have done anything to address this issue and ensure that the seniority principle followed almost fanatically by the judiciary would not be at the cost of merit? Salman Khurshid : It is very difficult to pick one Judge alone from a galaxy of Judges. But he was unique, somewhat like Mohammad Ali was to Heavy Weight Boxing. As a humanist judge I find he has few equals. His ability to marshal language in the pursuit of justice and use any acute intellect to cut through barriers of precedent in law remains unparalleled. Live Law: How do you evaluate the contribution of Justice Krishna Iyer to Indian polity, law and jurisprudence? Where does Justice Krishna Iyer stand in the pantheon of great Indian judges? Was he, in your opinion, the greatest Indian judge of the 20th century? Salman Khurshid : Justice Iyer was an outstanding judge. Live Law: Justice R.M. Lodha won fulsome praise from the Bar when he took the initiative to elevate Justices Rohinton Nariman and Uday Umesh Lalit from the Bar to the Bench. Unfortunately though he wanted Gopal Subramanium to be elevated as well, his name was rejected following an adverse IB report. There have been no dearth of competent advocates at the SC Bar since the time of its inception. Why do you think the Supreme Court until CJI Lodha’s tenure never even contemplated elevating someone from the SC Bar to the Bench? Salman Khurshid : Well it was done a few times earlier but there is a question that we need to answer: is it fair to those who give up a lucrative career to become a High Court Judge and then lose out to other talented lawyers who come straight to the Supreme Court Bench. Live Law: As a senior advocate of the SC, you are no doubt well acquainted with your colleague at the Bar, Gopal Subramanium. Do you think the rejection by the Union Government, of the Supreme Court collegium’s recommendation of Gopal Subramanium’s name for appointment as a judge of the SC was justified? Salman Khurshid : All I can say is that we lost a great Judge. Live Law: Though the Constitution permits the appointment of an eminent jurist as SC judge, this provision has never been invoked by the Executive till date. Why do you think the academic community continues to be ignored in the matter of appointment of SC judges under the ‘jurists’ category? Surely, there has been no dearth of eminent jurists and academicians like Prof. Upendra Baxi, Prof. Dr. N.R. Madhava Menon etc? Salman Khurshid : It is high time that we give our outstanding academics their due. Live Law: Sir, the powers of judicial review combined with the judicial recognition of “due process” doctrine as implied and inbuilt in Article 21 of the Constitution have made the judiciary arguably the most powerful of the 3 organs of the State. How do you assess the exercise of the power of judicial review by the Supreme Court and High Courts? This exercise, in several instances, has often invited criticism as amounting to judicial adventurism and judicial legislation? Do you think the Parliament has yielded to the Judiciary instead of asserting its rightful place and powers under the constitution? Isn’t the Executive and Parliament’s meek acceptance of the primacy of the judiciary in the judicial appointment process for over 2 decades, a subject which we have just now discussed, itself the best possible illustration of the capitulation to the judiciary? Salman Khurshid : Despite periodic inconvenience in a blessed society there cannot be a substitute for an intensely independent judiciary. People who criticize “Judicial activism” are justified to some extent and the same caution comes from the judiciary itself from time to time. But we need to reflect further on the very concept of democracy and its institutions before passing judgment on the judiciary. Live Law: The Land Bill introduced by the Narendra Modi government has been stoutly opposed by the opposition, including the Congress party of which you are a member. The BJP Govt claims that the Act as was passed by your government in 2013 contains difficult and impractical provisions, particularly the ones related to Social Impact Assessment and the Consent clause which made it difficult for Industry to acquire land thereby necessitating the introduction of the new Bill with modifications and improvements to the 2013 version. Is your opposition to the Land Bill therefore justified? Salman Khurshid : We have a principled position that has taken enlightened pragmatism into account. Without the safeguards we will unleash a volcano of discontent reactions in society and do great injustice between generations as well. Live Law: Do you see any possibility of a bipartisan consensus emerging in some form and the Land Bill being passed in the coming session of Parliament? Salman Khurshid : There are no signs of reaching out between the two sides yet. It is a test really of how the PM perceives Parliamentary democracy and upholds its sanctity. Live Law: Speaking to the media after the conclusion of the budget session of Parliament, Finance Minister Arun Jaitley remarked that Indian democracy currently faces a serious challenge with an “indirectly elected” Upper House questioning the wisdom of the “directly elected” Lower House. Jaitley’s statement has reopened an old debate about India’s decision to opt for a bicameral system of legislature. What do you make of Mr. Jaitley’s remarks? Is this statement of our Finance Minister a reflection of the Modi government’s growing frustration over its inability to push through its key reform legislation, the Land Acquisition Bill and the Goods and Services Tax Bill or does this signify anything deeper? Salman Khurshid : It is a remark that is very un-Jaitley like. Perhaps it is the pressure of mounting public expectation of delivery that forced him to voice his frustration. Live Law: Sir, the desirability of permitting foreign law firms to set up shop in India has been a talking point for some time now. Do you think it is desirable to permit foreign law firms to practice law in India? What impact do you think the entry of foreign law firms on the Indian legal scene will have on the legal profession and the practice of law in India? Salman Khurshid : There is a fear of the unknown and we are subjecting ourselves to working at indirect ways of doing what is not permissible to do directly. We need to discuss this dispassionately and work on a plan that is win-win for all sides. Live Law: Sir, moving on to the next part of our interview, can you share with our readers, the experience of your early days in the profession as a lawyer? What inspired you to take up the legal profession? Salman Khurshid : My choice of legal profession was largely intuitive. But it had something to do with public speaking skills, theatre and dealing with human beings in conflict areas that I was interested in since school. Live Law: How do you assess the capabilities of the present generation of young lawyers and juniors? Do you see an increasing tendency among the present generation of law school graduates and juniors to opt for the more lucrative corporate career route? Is the growing preference for a corporate career among our law students the result of inevitable fallout of the entry of the National Law schools and private institutions on the legal education scene? Live Law: Sir, you taught for a brief period of time, at the prestigious Trinity College in Oxford. Going back in time, how do you recount your experience as an academician? Did you enjoy teaching? What made you quit teaching at Trinity College? Salman Khurshid : I recall my years at Trinity College as the finest phase of my life. It spurred an incredible creativity that is virtually impossible to sustain in the world of politics. Live Law: A lawyer, Politician, Teacher, Law Minister, Foreign Affairs and Law Minister. Sir, you have excelled in all the above roles, all of which demanded a specific and different set of skills. Which role have you found the most challenging and which role did you like the most? Salman Khurshid : I imagine the reply to the 1st question above says it all. But of course outside academics I enjoyed the 18 months as External Affairs Minister of India more than any other assignment although my feel for Law & Justice remains close competition! Live Law: Sir, what is your view about the condition of legal education in India? How can the quality of legal education be improved in our country? Salman Khurshid : In the past 50 years the quality of legal education has improved immensely and this is reflected in the vast numbers of outstanding products of the new Law Universities getting place at the top universities of the world. However, a bill must be passed for a number of extremely active institutions that continued to cheer out quality lawyers, who need to pick up professional skills after enrolling at the Bar. There is no fresh answer but we need to flag this as a matter which is to be addressed. Live Law: Sir, what is the role of the Chief Justice of India in the judicial system of the country? How can the CJI make a difference in the justice-delivery system of the country? 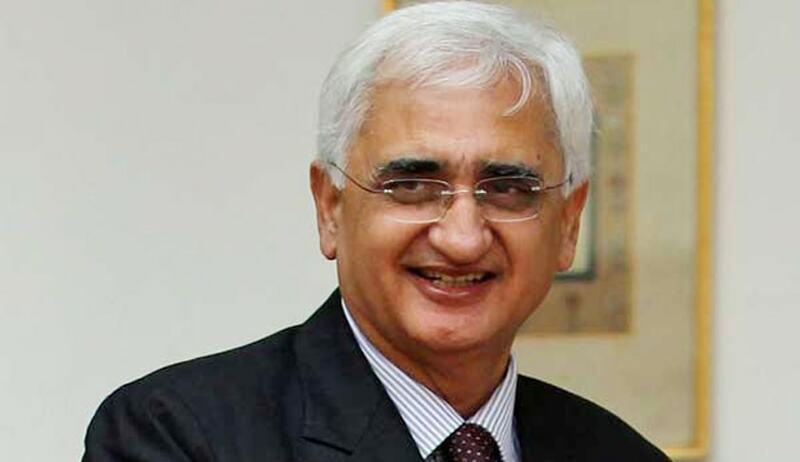 Salman Khurshid : The Chief Justice of India is Head of the judicial family. But, unfortunately, for the past decade the extent of one Chief Justice three years is the maximum that the incumbent serves in that post with several having served less than a year. I believe that to provide leadership there is a need to head a family as the valuable as Indian Judiciary, the Chief Justice must have ample time to flag desperately indeed reforms of our system. The need for expeditious disposal of cases at different levels is a paramount priority but it should not disguise or dilute the need for quality justice and the access of justice in terms of the cost involved. I believe the justice delivery system for criminal as well as civil jurisdiction needs to be developed more effectively. Salman Khurshid : Assuming that the Supreme Court upholds the NJAC, a huge responsibility will lie upon the Minister of Law and Justice to provide new paramount for a quality, meaningful dialogue on relationship between the Executive and the Judiciary through the persona of the Minister of Law and Justice. He would indeed be quite active in dealing about convergence on the policy of appointments and indeed on the application of policy with great specification.